This is the summary of an #ELTchat which took place on 18 January 2017. The full topic wording was ‘1-2-1 teaching tips – advice and best practice’. It was moderated by @Marisa_C and @SueAnnan with @tesolmatthew taking over for the 24 hour slow-burn. Lots of great links and resources were shared during the chat and these are listed at the end of the summary. A similarly themed topic was previously discussed on 16 February 2011 – see here. A good introduction to 1-2-1 teaching can be found here. I was personally interested in this topic because I have taught 1-2-1 before (both paid and as language exchange) and have just started doing so again. It is very common for English language teachers to tutor students one at a time at some point in their career. Support and resources for doing it are less so. For many it is a fundamental aspect of their teaching. It requires a development of strategy, approach and material creation. @SueAnnan kicked things off by stating the importance of doing a Needs Analysis. You might be surprised by the number of Ts who don’t do it. You also need to revisit it from time to time. Tailoring and finding the right material is important. @thebestticher stated that she tends to ask 1-2-1 students what topics and language they want as there is more opportunity to personalise. @fionaljp thought this was vital. @MConca16 said she always starts with a (structured) conversation class as a diagnostic. @Marisa_C felt that doing a pretest and/or Needs Analysis was obvious to those participating, so asked who [currently] teaches 1-2-1 and wanted to hear some ideas. Most of @SueAnnan’s Business English students are 1-2-1 – both oral and written. They have super interesting jobs. She thinks all levels are interesting and learns as much as her students sometimes. @MConca16 said she did 1-2-1 as well as 2-2-1 exam preparation. @fionaljp said she wasn’t but needed to give advice to those who may. @TeresaBestwick didn’t have any either, while @teacherphili said he was about to start again soon, but had previously focused on exam preparation as well as one young Chinese learner who mostly played games and did pronunciation practice. @David_Boughton stated that he likes the two ends of the spectrum, basic or very advanced. He finds the classic intermediates work so much better in group classes. Most of the activities out there are for them. @Marisa_C felt any age is suitable but activities are very different with young learners – mostly play. @fionaljp said she asked them to bring in texts of interest for discussion, to summarise and explain interest. Local newspapers provide material suggested @SueAnnan. There was general consensus that you can’t switch off in 1-2-1. It can be more tiring. You can’t set pair work. @fwalkerbcn said that you have to be on the ball, and be prepared to change the lesson plan on the spot. @thebestticher said she often tends to ask 1-2-1 students what they want – both topics and language – as there is more opportunity to personalise…@joannacre agreed, saying she often changes her lesson plan based on what her learner wants. It’s easier to do this with 1-2-1. @SueAnan said that if students bring work with them, they can become the teacher as they explain it, which is good for presentation practice. @thebestticher found that 1-2-1 young learners like to ‘be the teacher’ otherwise interaction is intense. It is a good idea to walk away or do another task while the student is working to make it less so. Or give them a research or listening task, added @Marisa_C. @fwalkerbcn felt this was difficult if you were in their living room, but you can always do something else to break it up, said Marisa_C . @fwalkerbcn hadn’t really found this as her classes were not long anyway. @MConca said that time is money … she doesn’t ‘waste’ time for quiet individual work or written feedback. Teacher Talking Time was a concern for @David_Boughton. He asked how it can be kept down in 1-2-1. Did we care as much as a group class? @teacherphili said good planning. Silence & processing time is important, too. @David_broughton liked that. We probably are more likely to cut the processing time shorter in 1-2-1. It’s just natural, he replied. @Marisa_C said it was difficult because the teacher is the only interlocutor. It’s very easy to get carried away with TTT. @joannacre said she makes her students do most of the reading, text and theories etc then comment on stuff. @SueAnnan asked if the participants do roleplays or simulations when you have to play a part? @David_Boughton replied ‘All the time. My favourite thing to do in 1-2-1. You have more control, so they often go much better.’ Role-plays are essential, according to @MConca16, especially when you’ve taught a student for years and need new stuff. @Marisa_C asked the chatters if they blended their 1-2-1 classes at all? even f-2-f classes do u flip or assign online work? She said Russell Stannard presented on her Delta course how to use Edmodo and it’s great. She wasn’t previously aware of all its functions. @fionaljp said she was going to use it next week. @fwalkerbcn said her students watched TED Talks before class. She also uses Edmodo for online quizzes, etc and asked if anyone else uses it for 1-2-1? @Marisa_C said not but they did use wikis, often dedicated to one student. @MConca16 used emails for writing tasks and marking/feedback. She added that reasons for 1-2-1 students to ask for individual courses is to have a real person to practise language orally with & get feedback. @SueAnnan felt they don’t want much tech. @David_Boughton agreed, saying that tech can take away from what they signed up for, namely access to a teacher. @thebestticher mentioned Off2Class, which offers an online placement test and games which she is planning to start investigating. @fwalkerbcn said Off2Class is fantastic. She uses it a lot with my 1-2-1 classes and is great for online use. It’s well worth exploring. They’re always updating- if you need a topic, they do their best to create a class for it, she added. @Marisa_C asked what tools were used to engage your 1-2-1 adult vs 1-2-1 young learners. Listening are perhaps issues for Ts. Audioboom and Vocaroo were mentioned by @fionaljp, who also offered two recording tools – Audioboom, Vocaroo – which still exist, unlike Voxopop which appears to have finished. @SueAnnan used podcasts. There are some great podcasts available from BBC world service. @joannacre pointed out that Harvard review org has some good free podcasts for adult learners. Later on, @rapple18 said Harvard has GREAT stuff inc. both reading, text and audio. @tesolmatthew added later that an ongoing podcast would be great. MConca16 said that @tablets & mobiles phone for teens work as motivators. @fwalkerbcn stated that linguahouse and OneStopEnglish have great lesson plans for adults. @Marisa_C offered several more tools during the chat, including @educreations, Voice Thread (for connecting more than one student), Schoology, Voxi, Explain Everything and Show Me. She mentioned in-browser apps such as Google docs or Primary Pad for collaborative writing and gave a shout out for the prolific Sean Banville (who was given a mention in the previous weeks’ chat). @SueAnnan said she liked working with English Central, which students can do at home and improve pronunciation, but the latter feature could be improved according to @Marisa_C. @fwalkercbn said she never really got on with it. @SueAnnan added that it works well when they do it as blended stuff. @tesolmatthew was impressed with the way the tool works. The principle of isolating and highlighting phrases is one that appealed to @Marisa_C. @David_Boughton said he had used English360 for a few years with a school he worked for. Although a lot of the resources are not useful. You only pay for the student – but there are LOADS of resources available, added Marisa_C. @David_Boughton added that he built out about 6 levels worth of courses. It must have been 100s of hours. @Marisa_C said it was an opportunity [for] long turn speaking activities, like storyboard karaoke and board games. In the slow burn, @rapple18 added her thoughts. Her list includes must-haves: a phone (=diary, map, aud/vid recorder), A3, coloured pens, today’s newspaper, relevant article, rods. She always try to add 3rd dimension to break the teacher-student eye-contact line, eg postits, cards, A3, ie lots hands-on activities. Student has goal e.g. a conference presentation. On a recent 12wk course: videoed a presentation at work. 1st. Input: personal’d+focused. Motivation high. If 1-2-1 ESP (re motivating the T!) use as opportunity to learn about student’s area of speciality. Can be bizarre but rewarding and fun! She also linked to material she wrote for OUP. @tesolmatthew said that his most involved ‘1-2-1 teaching happened +/-8 months, 2014. Met a Thai eye doctor in residence @ Boston hospital 2ce/wk for 2rs. Something we did was we wrote into the same notebook, sat very close, both wrote in, so prez+notes = same.’ Examples here. He also believed that it can be EASIER to keep TTT down in the 1-2-1 context, using prompt-listen-respond-prompt sequence etc. During the slow-burn @joannacre posted her 200th blog post about ‘websites, videos & random stuff I use in class’ which has some relevance. This was a great chat with lots of ideas and resources shared. It is one that I will come back to, along with the previous #ELTchat on this topic, as I do more 1-2-1 teaching myself. There were lots of tools and resources – links listed below. I have consistently used the phrase ‘1-2-1’ to mean ‘one to one’ although for brevity some participants used ‘1-1’ in the chat. If you have any more ideas or thoughts please add a comment below. David__Boughton, @fionaljp, @thebestticher, @fwalkerbcn, @teachingright, @TeresaBestwick, @MConca16, @joannacre, @teacherphili, @bar_zie, @aahk888, @amauryrez, @SerraRoseli and @rapple18. cover image: ‘one to one teaching’ from startupstockphotos.com – reproduced under a CCO licence. 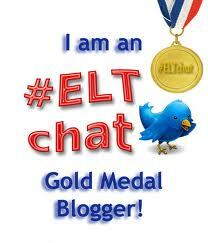 This entry was tagged #ELTchat, 1-2-1 Tuition. Bookmark the permalink. Hi, Phili! I learned about this chat in one of the FB groups I’m a part of and got very interested. I wonder if the issue of burnout came up as we know 1-2-1 sessions format is notorious for that. Plus, if anyone is using that format to make a living, it doesn’t always scale so well. As somebody on a LinkedIn forum said one day, “Skype lessons are a dead-end street.” I wonder if anyone is experiencing that. Finally, since the needs assessment came up and you brought up the placement test, I thought I would share with you other formats of assessment or “free trial”. I wrote a post on that very topic a few weeks ago, where I featured 3 “passive” assessment mechanisms that will help you reach out to more students, provide more value that you would in a 30-minute session and ultimately buy your products or services. Hi Elena. Thanks for stopping by and adding your comment. A few participants mentioned that it can be tiring, although ‘burnout’ itself wasn’t mentioned. Flexibility of delivery seems to be an important aspect. Meeting the individual students’ learning needs, too. What you say about guidance fits in with what we was discussed in the chat about teacher talking time – i.e. stepping away and letting student work by themselves. In 1-2-1 you need to be aware of what works and what doesn’t. I am interested to know how you got established and how long it took to set up your online business. I’ve added you on Twitter.